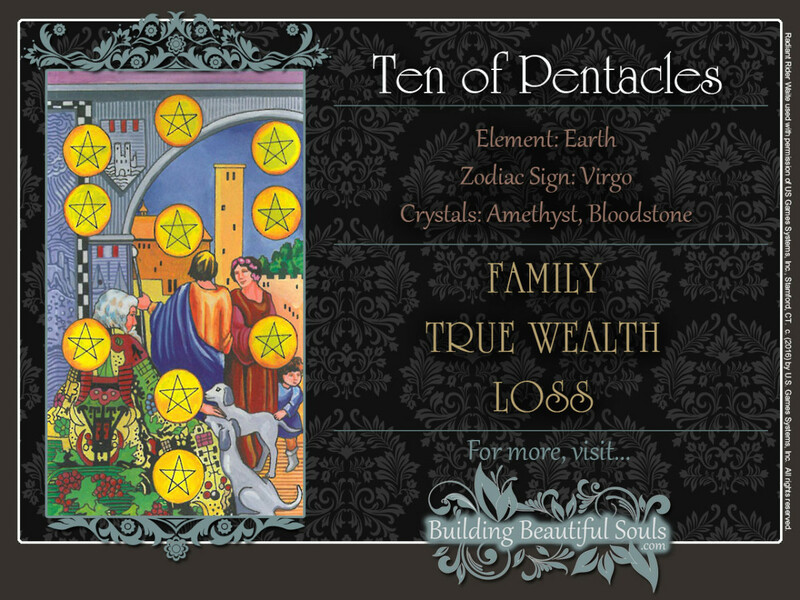 The Ten of Pentacles tarot card is more than just a money card. Just about every other card in the suit of Pentacles promises small and big money. But the Ten of Pentacles is also a card of understanding and fulfillment. It’s easy to be dazzled by all the coins and the happy domestic scene here: There’s the family in the large mansion with two dogs in the yard and grandpa coming for a visit. True, the Ten of Pentacles tarot card promises material bliss. But it promises so much more. The symbolism in the Ten of Pentacles card is very intricate. The pentacles are arranged in a pattern called the Tree of Life, representing the universe on all levels of consciousness: physical, subconscious/emotional, intellectual, and spiritual. The wealth in the Ten of Pentacles tarot card is not just dollars and cents. It touches all aspects of your existence, and this includes feeling and thinking rich. The stone arch is a gateway between the spiritual and physical worlds. It is carved with scenes and symbols of natural and moral law. The lesson in the Ten of Pentacles is that a good life is rewarded with material and spiritual wealth. The rich mansion on the other side of the arch shows the material rewards, and the old man in the colorful robes symbolizes the spiritual ones. The human figures in the Ten of Pentacles tarot card represent the circle of life – childhood, adulthood, and old age. The man and woman inside the arch are focusing on their accomplishments and each other. But the inquisitive child is playing with one of the dogs in the Ten of Pentacles, whose attention is focused on the old man. Dogs are a bridge between your spiritual and animal nature and sometimes, they can lead you to unexpected insights. If you’ve counted two dogs in the Ten of Pentacles tarot card, count again. Yes, there are two white ones, symbolizing innocence and spirituality. But there is a third dog. Its fur matches the old man’s robe so perfectly that it’s easy to overlook him at first. The cryptic symbols on the robe and dog point to a higher destiny. Wealth is so much more than money. And if the Ten of Pentacles tarot card is upright in your tarot reading, it’s all headed your way! At this point, you have become wise enough to know that being wealthy is not only about having money, but knowing how to get it and keep it. What you do with it is just as important as how much you have. As a truly wealthy person, you are filled with a sense of fulfillment, accomplishment and destiny. You know that everything is all right between you and the universe. This sense of stability allows you to be part of a community held together by love and friendship – like a family – in which you receive and give joy. The Ten of Pentacles tarot card spells good news in all money related questions. Even better, the Ten of Pentacles suggests lasting wealth, because you have gotten it through careful planning and looking at the big picture. Now your wisdom is paying off in a big way. An important project is panning out exactly as planned. Besides being quite profitable, it is also establishing you as an expert in your field, leading to other opportunities. This is a good time to think about ways to expand your business or making long term investments. More importantly, your financial security allows you to focus on your role in the community or spend more time with loved ones. If you’ve been thinking about starting a family, this is the perfect time. By now, you have also become keenly aware of the fact that powerful spiritual forces have been guiding your progress. They are calling to you now that you have completed one full cycle. In the Ten of Pentacles tarot card, the symbols on the old man’s robe suggest a spiritual journey lying ahead. Like Gandalf in the Lord of the Rings, he is about to knock on your door to let you know that the universe is so much larger than your comfortable Hobbit hole – no matter how magnificent it may seem to you. When reversed, the Ten of Pentacles is a stern warning that you have lost sight of the big picture. A past crisis may have thrown you off balance. Or you have decided that you can run your life on autopilot. It is important that you regain control of your situation. You are leaving too many things to chance. As it is, life just seems to be series of random events – some good, but most bad – that are happening to you with no rhyme or reason. You are viewing life in terms of how lucky or unlucky you are. But you’re not seeing how you are contributing to your own fate. If your colleagues ask you how you managed to get that performance bonus, you tell them you have no idea. If an attractive someone else asks you out for a date, you tell your friends you have no clue what that person sees in you. The problem is that you’re being perfectly honest. You really don’t know. In your view, you just got lucky. But if you don’t know what you are doing right, you won’t know what you are doing wrong when things take a turn for the worse. The reversed Ten of Pentacles warns of financial and personal losses. They often seem unexpected, and sometimes they are devastating. However, all of them can be prevented or minimized. Just think about how many lives are saved each year by functioning smoke alarms and fire extinguishers. Examine your strengths, talents, weaknesses, and options. Know the difference between what you can and cannot control. You may even need take a closer look at your definition of faith. True faith is not blind. It does not relieve you of the responsibility to make your own choices. In the Minor Arcana, tens show that an elemental force has run its full course. One cycle has been completed, and another is about to begin. Here, the energies associated with Earth have come to full bloom. All material needs are being cared for, and a higher destiny is now calling you.